Let’s start modifying the config.xml. Now we must explicit say that we are using the Tizen API, so lets add the Tizen feature. We just need to do a little adjustment to our code. To be more specific what is affecting the App is a change in the messaging API, because now the messageStorage is declared in the SMS service so we must access this field from the SMS to be able to query the SMSs. The smsService variable is at line 9, and the other variables were already declared before. We retrieve the serve just like before, but now we store it in a global variable to be used when send a SMS and the getMessages() has a little change. 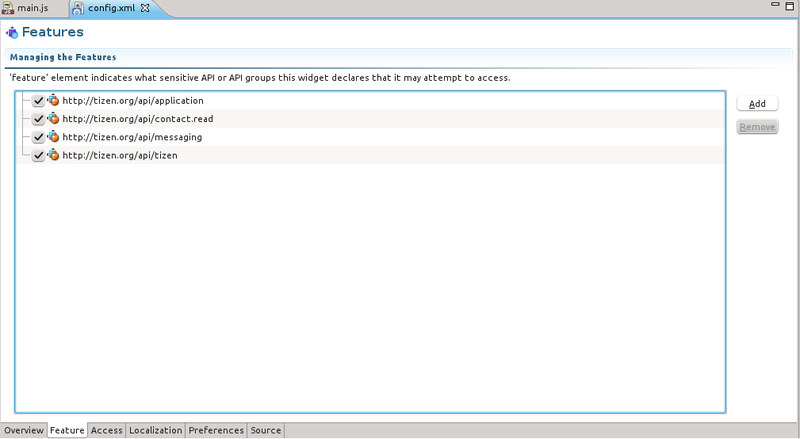 Like I said the messageStorage now resides in the SMS service, so we will access from there to fetch the SMSs. The function messageQueryCallback remais unchanged. Now in our sendSMS function instead of using a service that we receive as a parameter, we will use the global variable. //This means we don't have the contact in the list. And the HTML remains unchanged.